"Fiji sits in a complex tectonic setting along the boundary between the Australian Plate and the Pacific Plate." The sliding of these plates can generate long distance tsunamis. Secondary threat is that Fiji is situated inside the Pacific Ring of Fire and is vulnerable to tsunamis that might be generated by small islands collapsing due to volcanic activity. The threat is from tsunamis generated by near offshore earthquakes. One such threat was the on 14 January 2017 that recorded a 7.2 magnitude earthquake. A tsunami warning was issue but was not timely. The estimate for the shortest tsunami arrival time is 10 minutes. There is an real need to improve Fiji's Tsunami warning capabilities. The current system falls short in providing accurate and timely warnings to all in Suva. 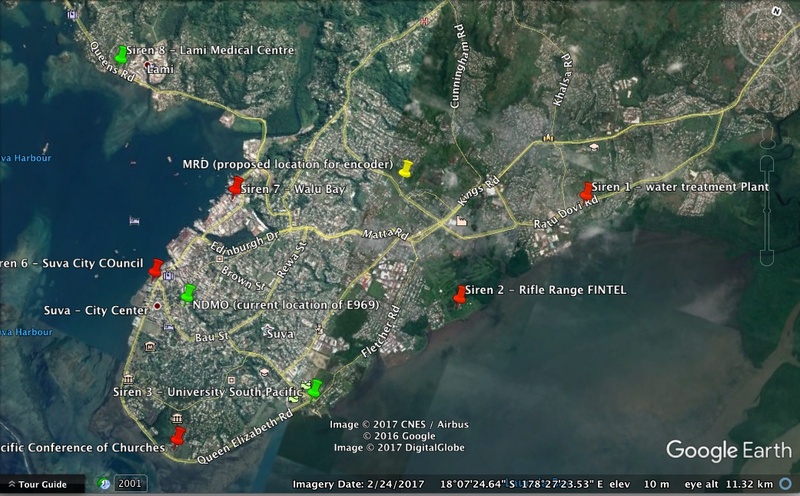 The capitol Suva has 2 Siren towers but new risk assessments indicate that there is a need to increase the capacity to cover the populated risk zones. The National Disaster Management Organization proposed sites, for installing the siren towers in Suva, are shown in the map. 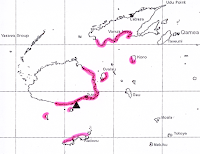 The last major tsunami that hit Fiji was in 1953. The image to the right shows the coastal areas that were severely affected. A magnitude 6.8 earthquake triggered a coral reef platform collapse and a submarine landslide. It was the most destructive in Fiji's recorded history; especially, with severe damage to the southeastern part of Viti Levu. Only 5 deaths were recorded. Spot On has been subcontracted by Tonkin + Taylor International to assist with the assessment of the current state of Fiji's Tsunami Early Warning System (EWS). Thereafter, propose design improvements. Spot On is providing expertise in EWS; specifically, with the use of state of the art ICT solutions for warning dissemination. The scope of the project is limited to the Capitol city Suva.